If you had not been born yet in 1966, you may have never heard of Dark Shadows. I am lucky enough to have been around long enough to enjoy this Gothic soap opera when it was first run on ABC from 1966 to 1971. Every afternoon, if possible, I was in front of the TV set to watch this favorite of mine. The show had many supernatural elements which were very daring for a daytime soap of the time. Not only was the subject of vampirism pretty much the main theme, but you also got stories of werewolves, ghosts, zombies, witches and warlocks, man-made monsters and even time travel. The show had a large following at the time, and even to this day, the show remains a cult classic and still has quite a number of fans. If you have yet to be introduced to this awesome piece of TV "horror" history, borrow it from a friend or relative, or better yet, start your own DVD collection. Enjoy the info below ... until next time! "The story of Dark Shadows begins with newly hired governess Victoria Winters arriving at Collinwood, the Collins' estate in Collinsport, Maine in search of her mysterious origins. She soon is caught up in the strange events and mysteries that seem to surround the Collins family. 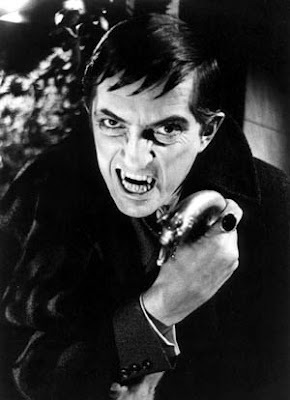 Eventually, the Collins' "cousin from England", Barnabas Collins, arrives and takes the show in a new direction; his vampire curse introduces a new history of the Collins family. Part of this revised history is the popular character of the witch Angelique whose jealously led to the tragic death of Barnabas' great love Josette and who placed the curse upon Barnabas." 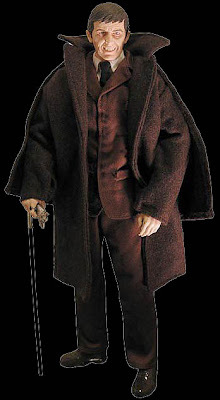 In 2006, Majestic Studios, a Hong Kong based manufacturer of action figures and collectibles, released a 12 inch, 1900's version of Barnabas Collins of Dark Shadows fame. I was lucky enough to add this one to my own collection, and I would definitely recommend it to anyone. The action figure comes with 3 different interchangeable heads: Normal, Vampire and Old Man and two pair of interchangeable arms. His trademark ring is included on the right hand of one of the included arms. Barnabas is dressed in his signature style outfit with walking cane accessory, complete with wolf's head. A display stand with the Dark Shadows insignia is included; however, he will stand on his own. This rare, hard-to-find collector's figure is currently available through Amok Time, one of the many sellers at Amazon.com. At the time of this post, there were only 5 left in stock ... so if you want one, don't wait too long. »» Click Here to Go There Now!